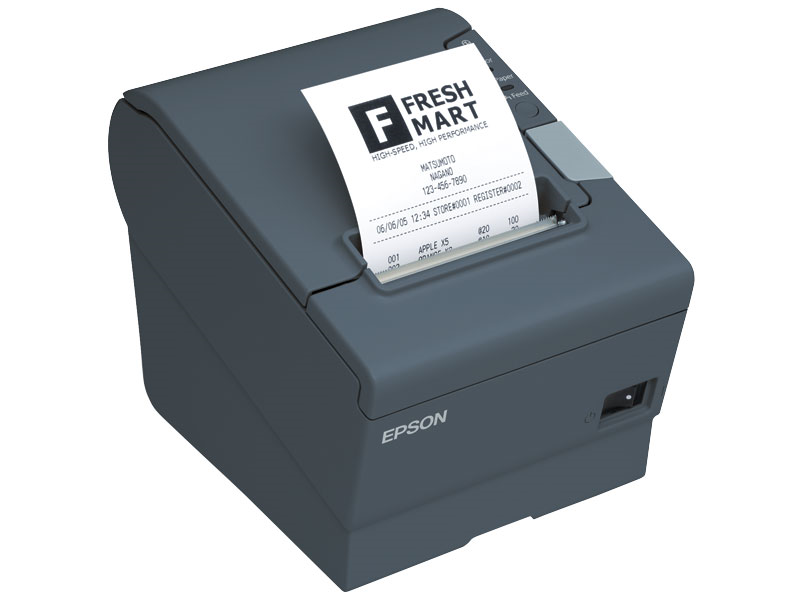 The TM-T88V from Epson is a top-of-the-range thermal printer packed with cutting edge features. Impressively, it is capable of full greyscale printing, meaning it can print black and white photo images on to receipts, ideal for marketing or promotional purposes. Logos, graphics, photos and layouts are all easily managed thanks to its easy to use software and USB connection. Epson have added paper-saving functions to the TM-T88V, including the ability to reduce line spacing on a receipt. An adapter is also included that allows the use of narrower 58mm till rolls in place of the standard 80mm. The TM-T88 is also energy efficient, using less than a single watt in standby mode. With print speeds up to 300mm per second, easy till roll changing and a cutting mechanism rated to last for 2 million cuts, the TM-T88V is fast, reliable and robust – perfect for use in any busy retail or catering environment. Available interfaces: serial RS232/USB,Ethernet/USB, Bluetooth/USB or WiFi/USB. Power Supply included. The Epson TM-T88V-iHub is a cut above the rest with it’s intelligent printing and integrated web server. The TM-T88V-iHub offers versatile connectivity for POS peripherals, allowing direct interfacing and communication with web-based applications. With the ability to print sales receipts via XML markup language directly from a web application, and with no need for driver installation, this proven ePOS printer allows for modern Cloud and Tablet computing and more mobility for order management. This make the TM-T88V-iHub perfect for tablet based POS systems, as all peripherals connect directly via the printer. 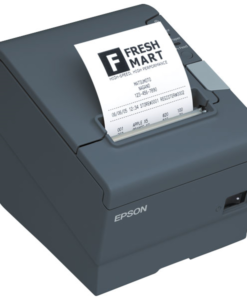 The TM-T88V with Bluetooth is Epson’s response to the rising need of compatibility with iOS and tablets, both gaining increasing traction in the EPoS world. These units have the ability to act as robust and highly affordable EPoS terminals, and with the TM-T88V Bluetooth, you can seamlessly print over bluetooth connection, allowing for an increasingly modern and wireless solution. Furthermore, compatibility stretches to handheld iOS and Android devices, with great features such as order input at the table, making WiFi and Bluetooth receipt printers some of the most highly sought after on the market. This reliable solution is perfect for those looking to increase employee productivity, and also those looking to futureproof their business. The TM-T88V-iHub interprets XML commands from HTML5 compatible browser setups. This intelligent design can work without any PC, saving costs on both hardware and infrastructure, and allowing your Cloud or Tablet based POS interface to operate free of hardware ‘interpretation’ and drivers. With the same great quality printing as the standard TM-T88V and all it’s great features, Epson do not disappoint with this lesson in ePOS innovation.